Just like any other surface on your vehicle, wheels are subject to water spots. The Microfiber All Purpose & Wheel Detailing Towel is a perfect choice for towel-drying wheels to prevent water spots. You can also use it to buff wheels after polishing. 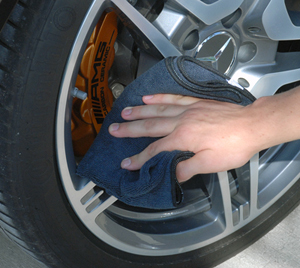 The microfiber will grab polish residue and any remaining brake dust so your wheels look spotless. The Microfiber All Purpose & Wheel Detailing Towel is super soft and absorbent, making it the perfect towel for drying wheels & tires. But that's not all the Microfiber All Purpose & Wheel Detailing Towel can do. Just like all our microfiber towels, it's suited for any detailing job. The Microfiber All Purpose & Wheel Detailing Towel is absorbent and soft. It will not scratch any finish, including factory clear coated or painted wheels. The 80/20 blend of polyester and polyamide is extremely tough. It's a great towel for detailing under the hood or wiping down door jambs. Note: If you use a Microfiber All Purpose & Wheel Detailing Towel on the wheels or engine, do not use that towel on other portions of the vehicle. This will prevent the transfer of grease or brake dust to the paint, glass, or metal. If the fear of blackened towels is keeping you from drying your wheels, get the Microfiber All Purpose & Wheel Detailing Towel.